Coconut Flour is a great substitute for white flour, as it is higher in protein and fiber. It is also wheat & gluten free! Its coarse texture offers the perfect consistency for a flaky and flavorful crust when preparing a tender white fish like Tilapia. The addition of chia seeds adds dimension, color, and lots of antioxidants! One of my favorite ways to prepare fish is by using a cast-iron skillet that is oven safe. I like to begin by searing the fish on both sides and completing the cooking process in the oven. It provides a nice crispness on the outside and a tender finish on the inside! Follow the instructions according to package. Use chicken stock instead of water for a more robust and full flavor. Ratio is 1:1; Use 1 1/2 cups broth for 1 1/2 cups lentils. Cook until tender. Thaw and rinse the fish fillets and set aside leaving slightly damp. Add the coconut flour and chia seeds into a flat, shallow bowl and mix until there is an even distribution of chia seeds throughout the mixture. Place each fillet into the bowl one at a time on both sides until fully coated with a nice crust! Repeat until each fillet is complete. Heat 2 tablespoons coconut oil on high in a large cast-iron skillet. Add the tilapia and sear on both sides for 1- 2 minutes on each side. ( be careful not to overcook). Once both sides are seared, place pan into the oven and cook for 8-10 minutes until fish is cooked through but still tender. While the fish is in the oven, in a skillet heat 1 tablespoon coconut oil and add the garlic and kale. Sauté until garlic is soft and Kale is tender, about 6 minutes. Cover and turn off the heat. Dress the lentils: add chopped parsley and juice of the second lemon to the pot of lentils. Stir and season with salt & pepper to taste. 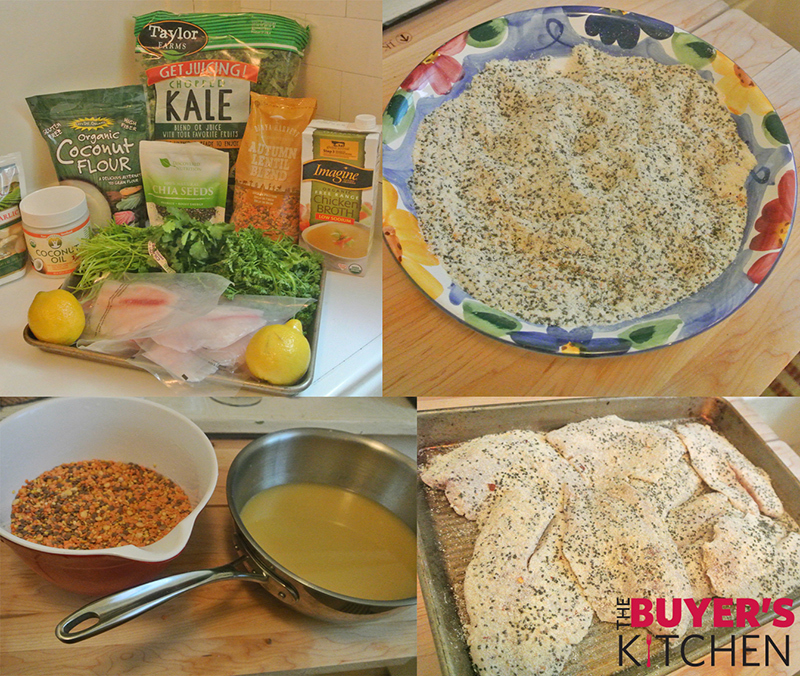 Plate the dish: Serve the tilapia atop the kale and lentils. Garnish with fresh parsley and lemon! Serve & Enjoy!